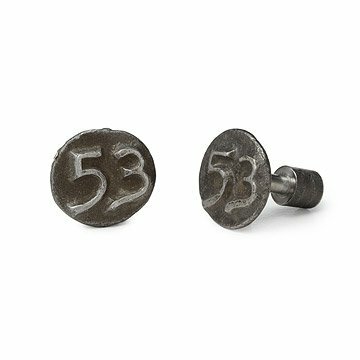 Hammer home an industrial statement with this set of date nail cufflinks. For an industrial statement piece that really hammers the sentiment home, this set of cufflinks is right on the mark. Each set of captivating cufflinks is made from authentic date nails in use from 1897. In order to record the date of construction, these steel markers were driven into railroad ties, bridge timbers, utility poles, mine props, and other wooden structures. In its relatively short history the only significant change to this system occurred in 1925, when the markers switched styles, from indented to raised dates. By 1969, date nail use declined rapidly and today they survive as relics of an antiquated method of date keeping during the height of America's Industrial Revolution. In order to turn these historical pieces into handsome shirt accents, the shank is milled down to create a post-style cufflink. Celebrate your anniversary or the birthdate of your Dad in old-world style, or give a set to your family's history buff to wear proudly on their sleeve. Made in the USA. Sold as a set of 2. Due to the nature of the reclaimed material, we are providing the following warning with each pair of cufflinks, as required by law: California Residents click here for Proposition 65 warning. Wipe clean with soft cloth. These cuff links come in a nice gift box and settled into what looks like a handcarved piece of wood. There is also a card that gives a brief history of date nails, and what railroad it's from. This is a perfect gift for history buffs, railroad/train enthusiasts, and anyone who wears a suit. We were worried that the fairly narrow post wouldn't hold position in the cuff of his shirt, but they work beautifully. I love the box it came in!! Perfect for a gift. These come in a beautiful little box with an explanation of what they are. Super Classy Gift. I bought these for my boss who is a man who has everything and needs for nothing-He's a history buff and absolutely loves these-he thought they were so cool and had never knew about date nails until now. I highly recommend. I purchased these cufflinks as a gift for my best friend. He enjoys wearing a variety of cufflinks and I have given him many sets but I have a feeling these will be his favorite. His father worked on the railroads and he looks up to him so much, so I purchased his father's birth year. They are such a unique way to incorporate history into something that can be worn and admired by others. They are sturdy, fashionable and come packaged with some history on the railroads and aren't just thrown in a plain box like every other pair I've given him. I can't wait for him to see them!!! I tolod my husband that the gift was as old as he is. Needless to say he never would have guessed that I had hit on the best gift that a train enthusiast could get as a birthday present. A great gift for someone with a lucky number. I bought these for my fathers 61st birthday. He is an architect and really appreciated the thought behind these and the uniqueness of these date nail cuff links. Super personalized classy gift for husband to remember his Dad who worked on the railroad. I picked the year his Dad was born. I scored points with this present! I found this to be so unique. My friend is celebrating his 60th birthday and he is really into trains. The railmark cufflinks will be a special gift. He is also someone that has just about everything and I hope he finds it extraordinary!